In their battle to save Earth from becoming another conquest of the alien Kasari Collective, Mark and Heather Smythe have struck crucial blows against the enemy. But their best efforts have still failed to derail the completion of the wormhole gateway that would give the insidious extraterrestrial invaders access to the planet - and doom humankind as helpless slaves of the Kasari hive mind. I picked up the Rho Agenda series in 2013. Can't remember what prompted me, probably a recommendation from Steve Gibson. I finished the Rho Agenda series in short order, and put the Rho Agenda Inception series in my Wish List for future reading. Didn't get to it until this year, when I heard that the third trilogy was finished. I figured I'd better get the prequel done. Then I re-read the Rho Agenda and started on the Rho Agenda Assimilation series. I was pleased with the story, loved MacLeod Andrews (except the one book with the other narrator). The background of the Inception series helped a lot. These books are full of action and adventure. Some heavy subjects, but nothing terrible. The last series had a disappointing ending for me, though. Sure, the main characters sort of had a happier ever after ending, but it just wasn't satisfying to have the AI take over, scattering much of humanity to the stars. 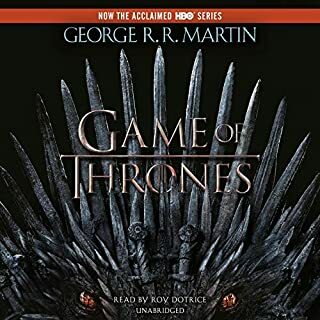 I recommend these three series to anyone who wants to get deep into a 9 book series without worrying about feeling they have to finish quickly. Lorness Carol, coming of age in the kingdom of her warlord father, Lord Rafel, aspires to wield magic. But she's also unknowingly become the obsession of Kragan, an avenging wielder as old as evil itself. He's waited centuries to find and kill the female prophesied as the only human empowered to destroy him. However, dispatching the king's assassin, Blade, to Rafel's Keep, ends in treason. For Blade arrives not with a weapon but rather a warning for the woman he's known and loved since he was a child. 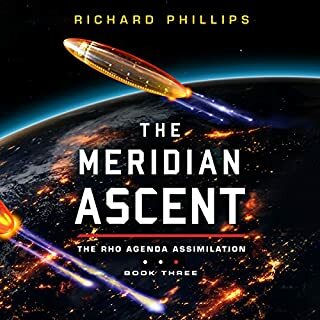 I'm not sure how I got turned on to Richard Phillips in the first place, but I read his Rho Agenda books soon after they were released and was pleased with them. Recently, I finally decided to take the Rho Agenda Inception trilogy out of my wish list, as I had heard he finished the third book of the third series, the Rho Agenda Assimilation. I started from the story's chronological beginning through the final story. I like Phillip's writing and the narrator, MacLeod Andrews. 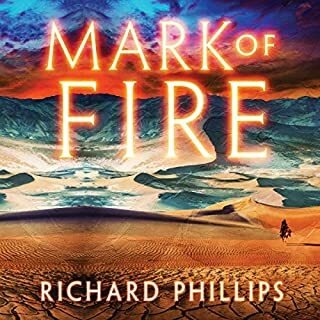 It was with some elevated expectations that I started Mark of Fire, hoping to continue the good storytelling. It took me a bit to get used to Caitlin Davies voice and intonation. I can't say she is my favorite, but after a while you get used to her style. As for the story, it is a nice, fun fantasy, mixing coming of age with magic and prophecy/legend. I'm sorry the next two books are not out yet, and will buy them, as I very much want to see how it turns out. There is some good world building, good character development (if somewhat predictable), and a story line that kept my attention. It doesn't however fall into the &amp;quot;must read&amp;quot; category - yet. I feel like I have had to lower my expectations a bit from the action-packed Rho series. This one is more unrequited love set in a magical fantasy world. Nothing new here, but I hold out hope. I do like Phillips' timeline details, however. He doesn't rush people from place to place. He takes into account that a caravan of 100 wagons will take several months to cross a continent, not a few weeks. Scouting parties don't return within the hour, but within the week. Resources must be secured along the way, not found in a pack in the back of the wagon. There seem to be some things that seemed odd to me, like how all the animals are identical to ones found on Earth, though the assumption is that this isn't Earth. Rabbits, deer, horses (along with bows and arrows, wagons, swords, etc.) all are the ones familiar to us rather than some off-world variant that provides the same function. They even have the same English names. This almost seemed like a corner that he cut in order to write more of the plot. Acceptable because it doesn't change the story, but seems a bit of a cheat. Overall, though, a good read. I have wanted to read this book/series for a while. I don't get HBO, so know nothing about it other than the buzz surrounding that TV series. I had some credits at a used bookstore that I needed to use up, and saw this at a reasonable price. Once I started to read it, it was apparent that I would not finish it quickly (without losing sleep). I used a credit on Audible to pick up the audio book and do my own manual "whispersync" as I went back and forth between the print and audio versions. Each has its own allure for me, but the narration adds quite a bit to the experience. Someday I might even see the HBO production. As for the story and plot, it is a space opera set in Arthurian times. I read somewhere that it was "Lord of the Rings meets The Sopranos". This is an apt description. It is a long story, and it doesn't seem to have a real ending. The characters, many as there are, are deep enough to care about (or hate), and the descriptions are not short. There are some sections where you want to skip over the tedium, but are afraid you will miss something important to the plot. I was never so bored as to wanting to stop, but it did feel tiresome at times (but then so did LOTR). I am now invested enough that I have picked up the next book (also at a bargain price) and downloaded the audio. I don't know how many I will read before wanting a break from the storyline, but I am enjoying it nonetheless, especially with the excellent narration. 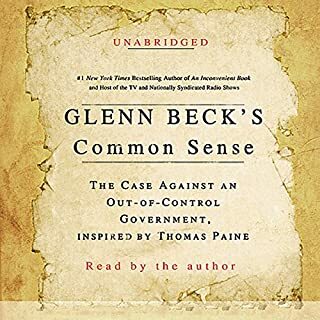 Glen Beck, the number-one New York Times best-selling author and popular radio and television host, revisits Thomas Paine's Common Sense with one purpose: to galvanize Americans to see past government's easy solutions, two-part monopoly, and illogical methods, and take back our great country. Most of the time, I agree with Glen Beck's philosophy. His arguments here are so compelling that it angers you, even if (and maybe especially if) you agree with him. I don't know if anyone could narrate this other than the author, and still have the passion that he obviously has and imparts. I was also surprised that a little more than halfway through his book ended. Then began a reading of the original by Thomas Paine. Though the language is hard to get used to at first, his arguments are just as compelling and give a great view of the historical setting at the time.